Are you hooked on a feeling yet? You will be when August's Guardians Of The Galaxy hits theaters. Marvel's space-faring adventure seems even farther away from current continuity considering we just went through the earthbound adventures of Captain America: The Winter Soldier. But Guardians is still planting seeds for future movies, even if they aren't the very next entries in the ongoing Marvel universe. EW (via GuardTheGalaxy) caught up with the James Gunn production, revealing a couple of new stills as well as a key bit of information for continuity junkies. James Gunn calls big bad Thanos, who is only a small part of the film, "the head of the snake," confirming he's in the movie by saying that he'll be depicted in motion capture. What's curious is that Gunn also illustrates the pervading notion that this story is happening in the background of the Marvel universe by noting, "We're definitely connected to 'Avengers 3.'" Whoa! None of us were even talking about a third Avengers! Where are you coming from, James Gunn? It's not like we have maps labeling the Marvel films until 2028! Though this does make sense: Thanos reared his head in Avengers but since then no one's said a word about this guy. In Guardians, we're dealing with his daughter Gamora (Zoe Saldana) as well as Drax (Dave Bautista), who is avenging the death of his family at Thanos' hand. And comic fans associate the big bad with the Infinity Gauntlet, made up of the Infinity Gems ("Infinity Stones" in the movies, apparently). Theories abound that the Tesseract of Avengers and the Aether of Thor: The Dark World are two of these stones, and the post-credits Dark World bit finds one of them in the hands of Guardians villain The Collector. Did you ever imagine all your comic reading in your youth would build up to this? There's also a couple of quick peaks. First, oh hey... the gang's all here, in matching outfits. Rocket, you've never looked more handsome. And here's where our comic knowledge stops short. 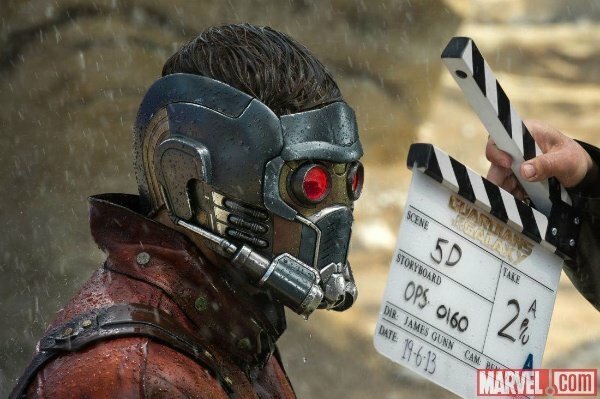 This doohickey in the photo with Gamora and Chris Pratt's Peter Quill features the object being heisted in the trailer. And it's certainly possible that's one of the Infinity Stones, no?